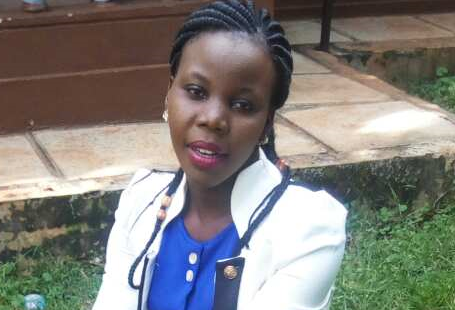 Advocates recently nominated Mercy, a young leader from its partner organization in Kenya, Supporting Primary Education Across Kenya (SPEAK Kenya), to serve as a reviewer for an upcoming supplement to the renowned scientific journal, entitled AIDS. Mercy works with SPEAK Kenya and supports their efforts, in partnership with Advocates, to mobilize communities, engage stakeholders, and train teachers in support of school-based sexuality education in Homa Bay County. We are thrilled that Mercy was selected for this opportunity as she brings experience working directly in her community to educate peers about HIV/AIDS and how to support young people living with HIV. The supplement will be called “Achieving 90: Young People, HIV Testing Services and Linkage to Treatment.” Organized by YouthPower Action, an international youth development project spearheaded by FHI 360, this opportunity allows for youth reviewers to comment on articles submitted to the journal from a wide range of countries including Kenya, Malawi, Tanzania, South Africa, Zambia, Zimbabwe, and the U.S.
Once the supplement is out, we will be sure to share it with all of you! Advocates is proud to be an ally to Women Deliver’s Deliver for Good campaign. The Deliver for Good campaign connects the issues that affect girls and women through an integrated approach and focuses on solutions and action across 12 investment areas. February was focused on the Sexual Health and Rights. To read Advocates’ post for the month of February, go here. Coursera is offering a free online course in global adolescent health, starting on Monday, March 6, 2017. This course is an eight-week course, but it is self-paced, so you can adjust time for course readings and videos according to your availability. The course addresses many diverse issues including nutrition, sexual and reproductive health, non-communicable diseases (NCDs), and the global burden of disease for young people. The course is free of charge. You can register to access the course materials, which include video lectures (5-10 minutes in most cases), readings, and discussion forums where participants can have online discussions with others who registered for the class. The course is led by Professor Susan Sawyer and Professor George Patton, from University of Melbourne (Australia). They are leaders within the Lancet Commission for Adolescent Health and Well-being. The 1st ever specially designed social platform on Advocacy for Comprehensive Sexuality Education is now online! Thee African Women’s Development Fund (AWF) invests in women’s rights organizations as leaders in advancing women’s rights, and as a core force for demanding accountability and respect, protection and fulfilment of rights for all women from duty bearers at all levels. AWDF is one of four Women’s Funds from the Global South managing Leading from the South – a funding initiative created to resource women’s rights activism in the global South over 4 years. The fund was initiated with support from the Netherlands Ministry of Foreign Affairs as part of their commitment to the implementation of Sustainable Development Goal 5. It supports activism devised, implemented, and led by women’s rights organizations in the global South. The fund is being implemented by four women’s funds: Three are Regional Funds: African’s Women Development Fund (Africa and the Middle East Region), Fondo Mujeres del Sur (Latin America and the Caribbean) and South Asia Women Fund (Asia); and one global fund AYNI – the Indigenous Women’s Fund. AWDF is mandated to fund in all 54 African countries. Under the Leading from the South initiative AWDF has expanded its grantmaking mandate to include selected countries in the Middle East. There are three different grant size categories: Yalla, Ananse and Pamoja. Download LFS application guidelines here. The Regional SRHR Fund is soliciting a call for proposals for organizations working in Southern Africa (Malawi, Mozambique, South Africa, Zambia and Zimbabwe) on education, Sexual and Gender-Based Violence and Education. Proposals for grants will be considered from organizations that have put forward innovative and strategic ways to address the intersectionality between child marriage and one or more of the following three topics: sexual and gender-based violence, HIV/AIDS and education. The maximum funding available per proposal is $US 15,000 and the deadline is March 27, 2017. For more information, go here. The Intersex Human Rights Fund supports organizations, projects and timely campaigns led by intersex activists working to ensure the human rights, bodily autonomy, physical integrity and self-determination of intersex people. Given the dearth of funding to intersex issues globally, intersex groups/projects based anywhere in the world are eligible to apply. Groups with small or no budgets, staff or structures are eligible and encouraged to apply. Proposals may be submitted in English, Spanish, French, German, Mandarin or Russian by March 15, 2017. More information about the fund, grants criteria and proposal can be found here or during the twitter chat sessions. The Deliver for Good campaign focuses on the whole girl and the whole woman—not just her health needs, her educational needs, or her rights. The month of March is dedicated to Strengthening Women’s Participation and Women’s Participation and Decision-Making Power. – To learn more about the campaign, go here. – To sign the Deliver for Good commitment, go here. – To access the toolkit, go here. – You can also download the commitment card or the overview card to share with others. 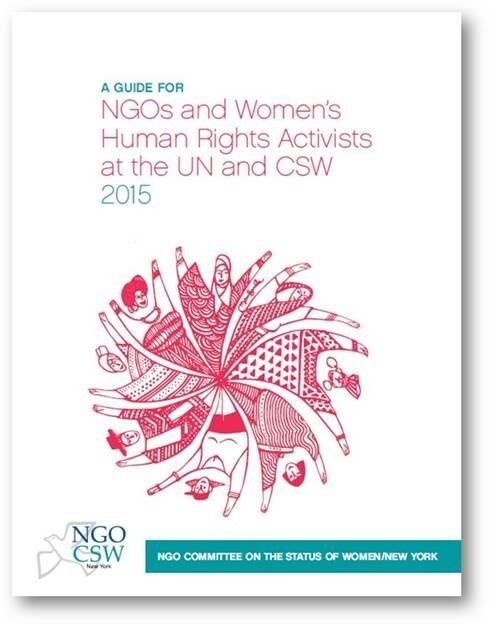 This guide provides background information on the Commission on the Status of Women and serves as a resource to activists attending the meeting. To access the guide, go here. 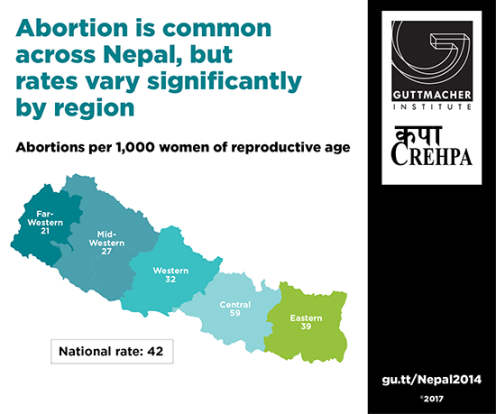 This report shared results from a national study on the incidence of abortion and unintended pregnancy in Nepal. Findings show that despite abortion being legally available, many Nepalese women have potentially unsafe abortions performed by unapproved or untrained providers. The study reports that approximately 323,000 induced abortions occurred in Nepal in 2014, resulting in an abortion rate of 42 per 1,000 women of reproductive age (15–49). Meanwhile, out of all induced abortions, only 42 percent were provided legally. This report presents findings and recommendations from a study, including programmatic and evidence gaps, as well as best practices. Among the report’s key findings are that there is a lack of SRH programs that are exclusively focused on adolescents; there is a critical gap in sexual and reproductive health information and services for unmarried adolescents, especially girls; traditional awareness raising approaches remain the most common; and school-based interventions are increasingly popular for reaching adolescents, but face serious implementation challenges. Detailed findings and recommendations are available in the report; an accompanying policy brief is also available. To access the study, go here. This research brief provides findings related to service utilization at Kenyatta University, including insights on student ‘demand’, university-based ‘supply’, and the broader campus environment. 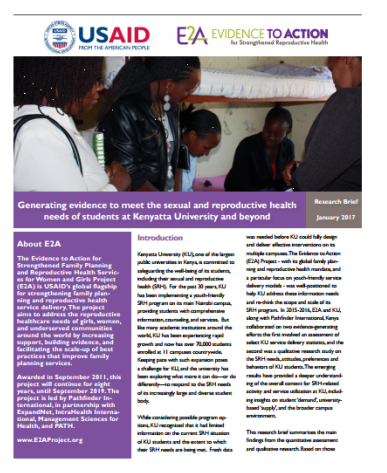 The brief includes recommendations that can be applied to strengthening sexual and reproductive health services for university students on the campus. To read the brief, go here. This report shares findings from an evaluation of ICRW’s PAGE program. The PAGE program was designed to empower adolescent girls and build their job skills in schools in low-income communities in New Delhi, India. The program was implemented in four government schools over a 14-month period and reached approximately 4,000 girls. ICRW’s evaluation of the program measured several key outcomes to understand the impact on girls’ empowerment and outcomes around girls’ employability. To access the report, go here. This manual provides security trainers and facilitators of human rights defenders with best practices for security trainings, stand-alone workshop session plans, and a complete holistic security curriculum. The manual is divided into three parts: Part I includes general articles on best practices in facilitation of security and protection trainings for human rights defenders; Part II includes stand-alone sessions; and Part III includes 11 sequential sessions. You can access the manual here. With important contributions from the Naz Male Health Alliance and the Forum for Dignity Initiatives, this report includes a literature review, interviews, a landscape analysis and policy recommendations regarding the transgender community in Pakistan. To read the report, go here. Mark Your Calendar: International Women’s Day is March 8th! March 8th marks International Women’s Day! This year’s theme is “ Women in the Changing World of Work: Planet 50-50 by 2030.” The theme is intended to encourage activists to consider how to accelerate the 2030 Sustainable Development Agenda, especially as it relates to goal 5: Achieve gender equality and empower all women and girls; and goal 4: Ensure inclusive and quality education for all and promote lifelong learning. You may also want to explore how the theme focuses on new commitments under UN Women’s Step It Up initiative. • By 2030, ensure that all girls and boys complete free, equitable and quality primary and secondary education leading to relevant and Goal-4 effective learning outcomes. •	By 2030, ensure that all girls and boys have access to quality early childhood development, care and preprimary education so that they are ready for primary education. •	End all forms of discrimination against all women and girls everywhere. •	Eliminate all forms of violence against all women and girls in the public and private spheres, including trafficking and sexual and other types of exploitation. •	Eliminate all harmful practices, such as child, early and forced marriage and female genital mutilation. Organize a community or school event to raise awareness about International Women’s Day and the new Sustainable Development Goals and invite a speaker to talk about some of the challenges and successes facing young women’s access to education and the world of work. Meet with decision makers and community leaders to find out about existing policies related to gender equality and education and employment. Trump’s ‘global gag rule’ could endanger millions of women and children, Bill and Melinda Gates warn. The “global gag rule” imposed by Donald Trump, blocking US funds to any organisation involved in abortion advice and care overseas, could impact millions of women and girls, endangering their lives and those of their babies, Bill and Melinda Gates have warned. To read the article, go here. More Women Delivering In Hospitals, But Many Still Dying During Childbirth, Shows Study (India). Surujmuni Marandi, 24, decided to deliver her baby at the district hospital in Godda, Jharkhand. Like many, she was drawn to the idea of free medical assistance, medicines, nutrition and post-natal care for poor, pregnant women promised by Janani Suraksha Yojana (JSY), the government programme aimed at reducing India’s high maternal mortality rate (MMR). To read this article, go here. Cut in secret: the medicalization of FGM in Egypt. Despite banning female genital mutilation (FGM) in 2007, Egypt has among the highest rates of FGM in the world — with 87 per cent of girls and women between 15-49 having suffered the painful procedure. Plan International works alongside some of the girls, men and women fighting FGM across the country — these are their stories, as told to Plan’s researchers. To read this article, go here. Denmark to set up fund to access abortion in response to Trump gag. An alliance of European countries is fighting to replace funds for family planning services following Donald Trump’s reinstatement of the “global gag rule” blocking US financing of groups that give women information about terminations. To read this article, go here. In Kenya, midwives on motorbikes save mothers from perilous journeys. Leparua, Isiolo County, Kenya – it takes three hours to snake downhill on a motorbike, skirting gingerly around mud puddles, but for Salome, it feels like days. Riding side-saddle, she exhales sharply over each bump on the track and rubs her heavily pregnant belly protectively. To read this article, go here. Venezuela is running short on HIV meds—and places to turn for help. On top of its currency being in free fall for 3 years running, empty shelves at supermarkets, and electricity rationing, Venezuela has a serious shortage of medicines, including life-saving anti-HIV drugs. This led a network of Venezuelans living with HIV to seek “urgent humanitarian aid” in June 2016 from the Geneva, Switzerland–based Global Fund to Fight AIDS, Tuberculosis and Malaria. But because the World Bank classifies Venezuela as a high-income nation, the Global Fund on 18 January denied the request. “As an agency relying itself on donations from multiple stakeholders, the Global Fund is not in a position to grant any exceptions from its rules,” wrote Executive Director Mark Dybul and chair of the board Norbert Hauser. To read this article, go here.